Kicking off our celebration of Eric Carle’s birthday this week we’re sharing three The Very Hungry Caterpillar craft ideas. The Very Hungry Caterpillar is our favourite of Eric Carle’s books and is the first book I ever read to both my girls. It’s masterpiece of a children’s story, a joy to read and look at, and bursting with possibilities to use as a spring board for lots of crafting, exploring and learning. Mr. Carle is celebrating his birthday this week and Kate at An Amazing Child blog is hosting a week of fun, linking up many early years bloggers who are sharing ideas for activities and crafts linked to Mr. Carle’s books. 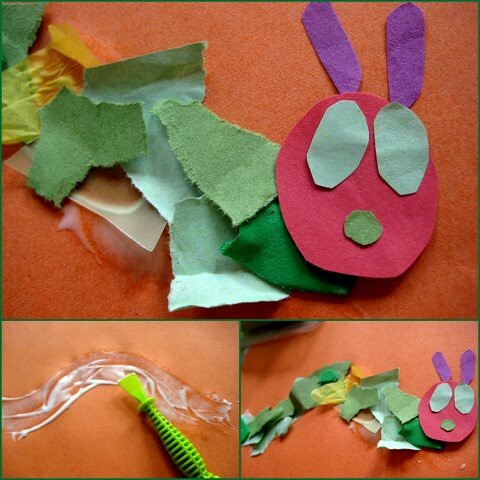 We’re sharing some caterpillar craft ideas today and some butterfly crafts tomorrow. 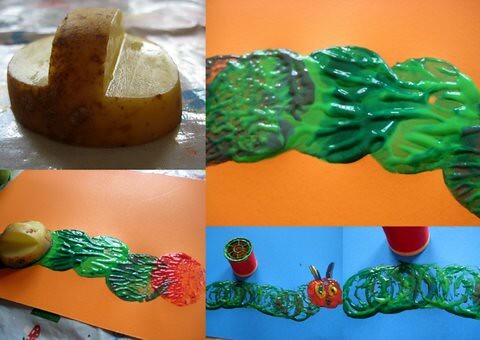 On Thursday we have a post full of ideas you can use to explore The Very Hungry Caterpillar with links to the EYFS. Eric Carle is famous for his signature style, combining colour and texture and The Very Hungry Caterpillar is a perfect book to use to inspire children to try some art and crafting. When creating with young children I always like to give them plenty of opportunity to explore materials their way. Even though these projects are all designed to result in a caterpillar there is plenty of scope for each child to experiment and add their own style to the creations. 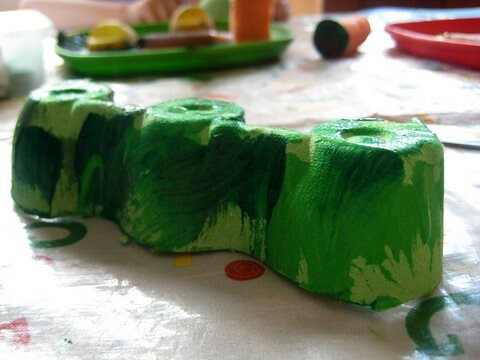 The caterpillar crafts are all very simple to follow, inviting even very young children to have a try. Provide some round objects to print with: potatoes (with a handle cut out to help little hands), carrots, cut in half (great for toddler hands to grasp) and cotton reels. 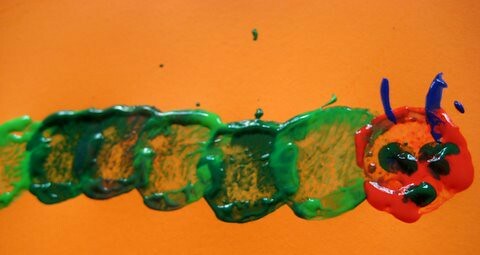 Add several shades of green, and some red for the face, and let the children stamp out a caterpillar from the circles, selecting which shades they like the best. You don’t need to worry about keeping things neat and orderly – as much stamping as they like, overlapping circles in different shades, will give you an effect very like the original Hungry Caterpillar. 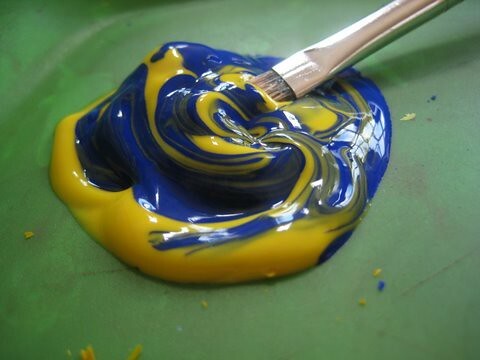 This is a good craft for talking about colour mixing as you can have fun testing out combining blue and yellow paints. Let the children experiment with different ratios of the two colours to create lots of different shades. Spread glue in a caterpillar shaped arch and add lots of different shades of green paper, combining as many patterns and textures as you can. Let the children choose which pieces they like best. Add a red face to complete your collage. Add a face and finger paint some eyes and a mouth. Two bendy drinking straws make perfect antennae. You can use your model to act out The Very Hungry Caterpillar story or take it out to the garden for some small world play. 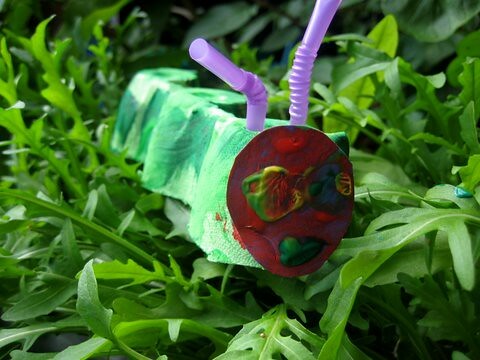 Find your caterpillar a nice green leaf and he’ll feel much better. I love these and the potato with the handle is an excellent idea.Thanks for sharing. Hi Isil – it’s a really simple trick but makes all the difference for little hands. Ooh, some great ideas. I made my now 7YO a Hungry caterpillar story sack when she was about 3. I still find her playing with it now. Unfortunately, once again, children’s true, authentic art is undermined by the “CRAFT”. Please, please, please research and learn about the value of child-directed art, and the damage done to children’s creativity by teacher-inspired, teacher-directed, teacher-centered crafts such as these. Children should be able to create whatever they want. Provide the materials, give them time and lots of inspiration, then let them do what their bodies and developing minds tell them to. I appreciate you taking the time to comment No Crafts Please. My children spend the vast majority of their time enjoying child-initiated play, in an environment which supports and encourages this by providing interesting materials for them to use freely. Lots of their play and creativity is shared in this blog. And once in a while we do a craft too, which my junk-model-mad eight-year-old especially enjoys. 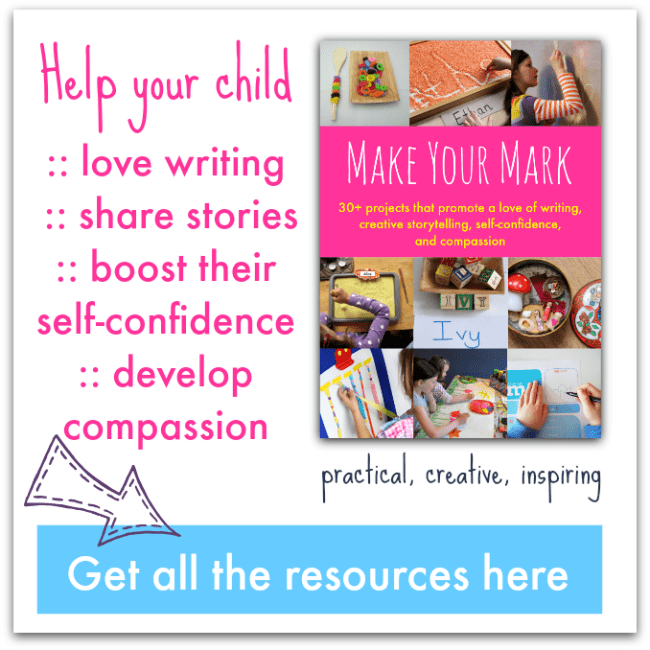 Our craft posts are amongst the most popular on the blog and I think they’re a good introduction for parents who aren’t particularly comfortable with messy play, or who don’t feel confident about encouraging child-led activities/exploration – a starting point to enjoying the process as much as the product. Whenever I share a craft idea I try to include suggestions to promote creativity and give the children opportunities to make their own mark. I find crafts based around books or characters can be a wonderful springboard into play, as the models the children make then become toys for them to play with imaginatively. These are some reasons I feature crafts on the blog. Aaah I think they are all lovely! One cuter than the next… great that your kids get to explore so many different ways of making a “the same” thing. Lovely. 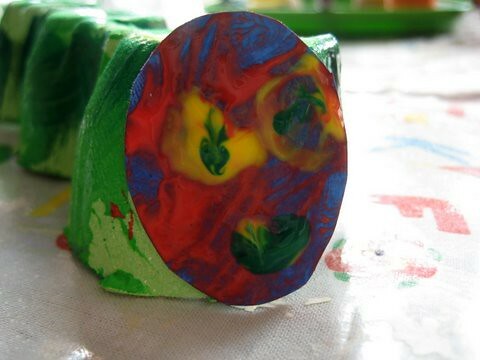 And thanks as always for linking up to Kids Get Crafty! Awesome Craft! We love The Very Hungry Caterpillar!